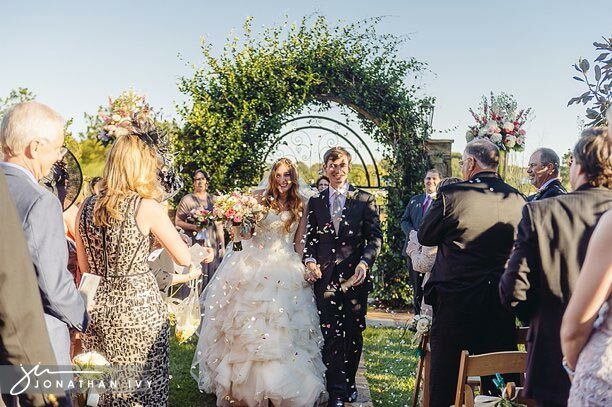 Their gorgeous private estate wedding took place in Cypress, TX at the home of Lauren’s parents. This wedding was a labor of love in many ways! The Haggar family build a beautiful barn just for this event on the back side of their property. Lauren & Sky’s wedding was the very 1st event to take place there. Natalie with Two Be Wed teamed with the family along with A Fare Extraordinaire to create a one of a kind backyard wedding. The bride wore a gorgeous Lazaro gown from Ivory Bridal Atelier that beyond fun to photograph. Here are a few of our many favorite for this stunning North Houston outdoor wedding. The ceremony took place right in front of the Haggar home! The bride had a little surprise for her parents. She hired a painter from Austin to come out and paint the entire reception scene as it took place. Here you can see Lauren was pretty pleased with the progress!